1.) 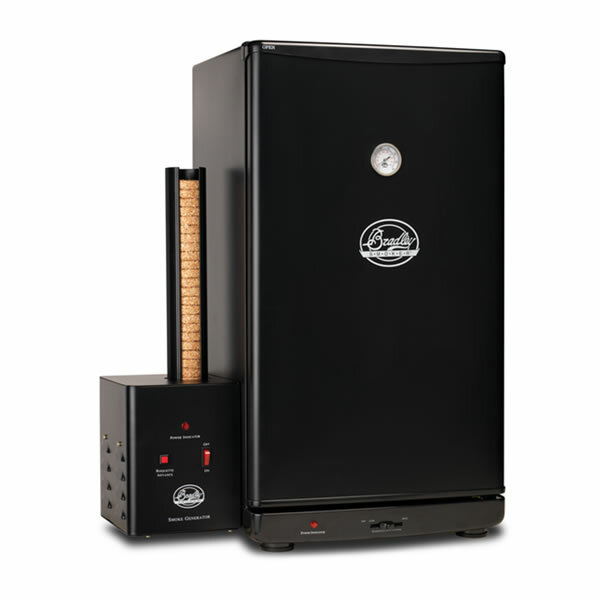 Its ability to cold smoke products. As much as I tried to do low-temp smoking on my Weber kettle grill, it took a lot of effort, hands-on adjusting of the coals and meat, and still gave consistently uneven results. 2.) It was recommended by two trustworthy sources, Ruhlman's book Charcuterie and it was the smoker used by Mosefund Farm at Pigstock. 3.) Bradley has a very active online discussion forum. I know it sounds like a minor thing, but I found it very reassuring to see lots of smoking enthusiasts talking about recipes they'd tried, troubleshooting, and modifications for smoking larger volumes of meat at once. To me, this shows that Bradley has a happy customer base who regularly use their smokers and give feedback on the results. Now on the condition of "if I got the smoker for Christmas," Carla made me promise that the first thing I would make for her was the cheese sausage I brought back from Pigstock. It was a mildly spiced pork sausage, finely ground, spotted with small cubes of young gruyere that become stringy and gooey upon cooking. These sausages just have a mild smoking, so we smoked them with hickory for about two hours. During the entire time the temp never went above 100 F. Carla's brother came up for the weekend, and it was great to have another set of hands for the sausage making. We also made venison sausage from an 8-point buck Carl shot. It was spiced like kielbasa, enriched with pork fat, then smoked for about 3-4 hours with hickory and maple wood. For my first time using the Bradley, I'm really, really pleased. We easily fit about 10 lbs of sausage into the smoker. Now I'm curing some mangalitsa belly to hot smoke like bacon, along with future plans to smoke salmon and trout, pig jowls, and of course assorted chickens and ribs.